Plunging 129 feet over a moss-laden cliff, Burney Falls is arguably California’s most impressive waterfall north of Yosemite—so beautiful and picturesque that President Teddy Roosevelt reportedly dubbed it the “eighth wonder of the world.” The falls are now the centerpiece of 910-acre McArthur-Burney Falls Memorial State Park—11 miles north of Burney, California—and can be accessed by way of the 1-mile Falls Loop Trail. Following switchbacks down to the falls’ base, the trail climbs a canyon wall, past the top of the falls, to a footbridge over Burney Creek and loops back to the Visitor Center. 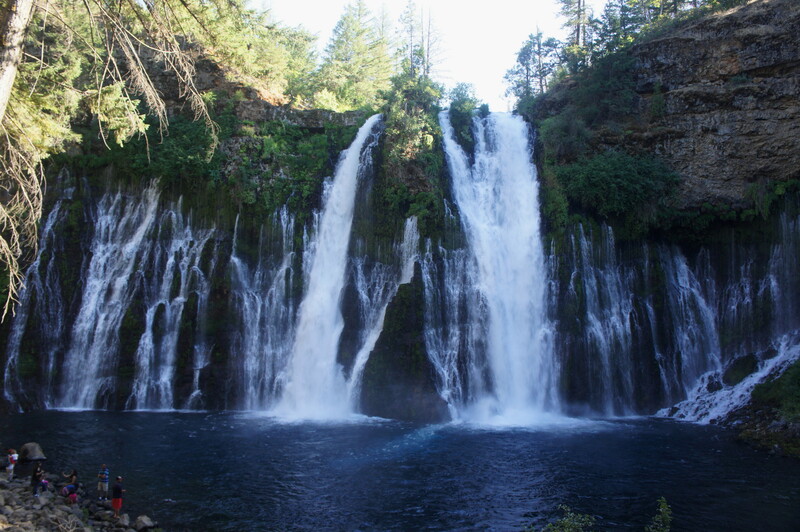 The descent to Burney Falls is steep, losing around 150 feet in elevation in less than 300 yards. After dropping down a pair of switchbacks, the path comes within reach of the falls’ shrouding mist; photographers line the path, seeking to capture the thunderous falls in a picture that will, undoubtedly, not do this place justice. 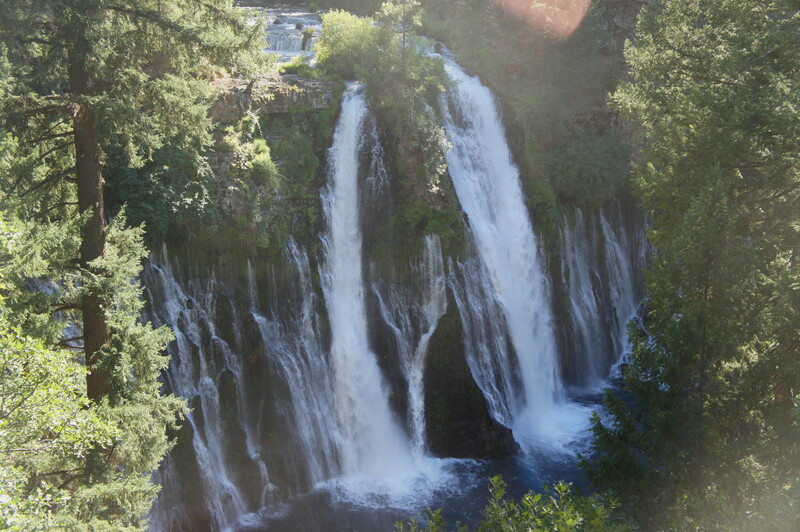 More than 250 feet wide, Burney Falls carries a considerable volume of around 100 million of gallons per day. Two primary chutes carry the bulk of the water, but what makes Burney Falls unique are the hundreds of smaller, silky threads that seep out of whitewater springs in the mossy wall. 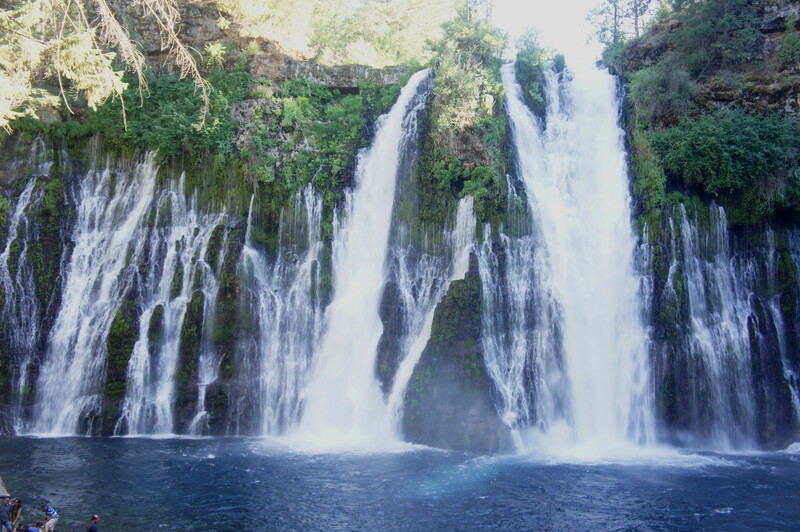 While Burney Falls is neither the tallest nor the largest waterfall in the state, it makes a claim for California’s most visually scintillating. Most visitors will turn around after enjoying the falls and head back up the switchbacks to the Visitor Center. 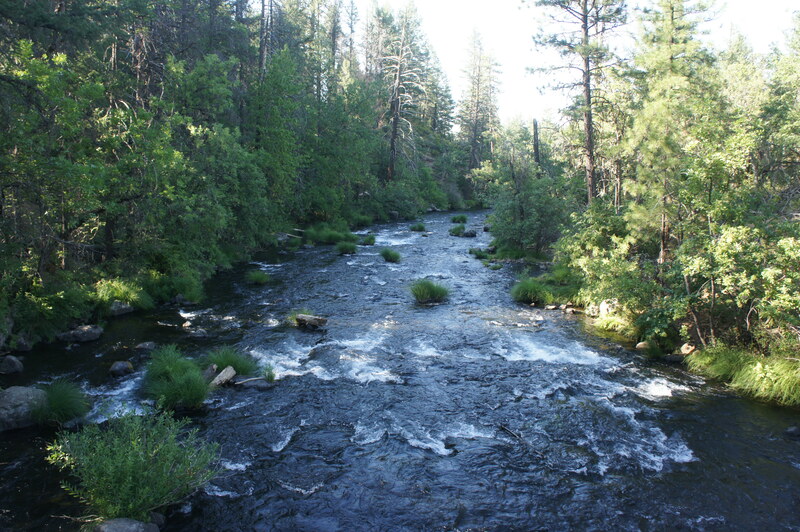 But eager visitors can go farther, bearing right at the falls and continuing downstream along the banks of Burney Creek. A pair of rock slides on the right serves as a reminder of the area’s volcanic legacy. Amid the shade of oaks, Douglas firs, and riparian bushes, bear left at the trail fork at 4/10 mile, crossing Rainbow Bridge to the east side of Burney Creek. Bear left again and prepare to climb, as the trail begins a sharp ascent up the east flank of Burney Canyon. 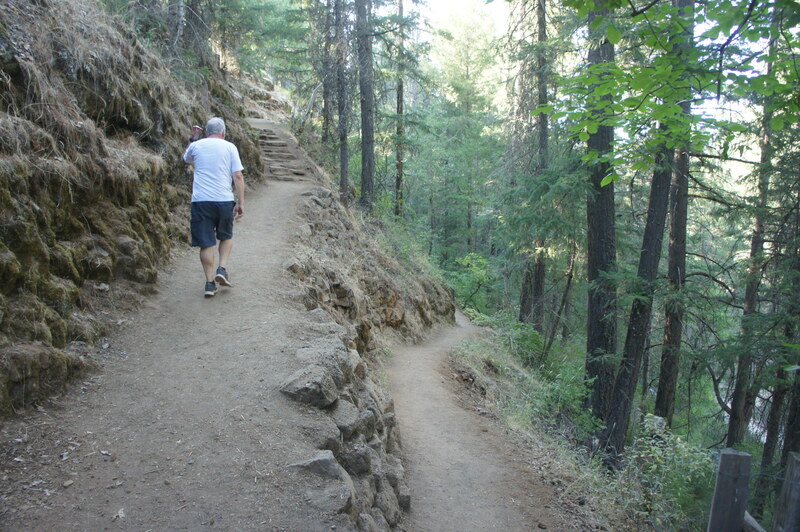 Round a switchback at around 6/10 mile with obscured views of Burney Falls from about halfway up. 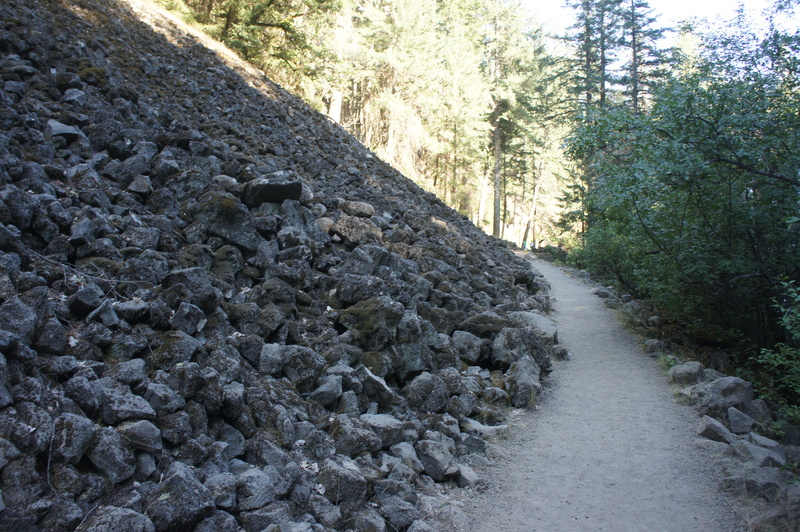 The steep incline gives way to rocky stairs and a junction with a spur that leads to the Pacific Crest Trail, which briefly passes through the park. From here, the terrain levels out, and the path approaches Burney Creek again, this time upstream from the falls. At ¾ mile, bear left and cross Fisherman’s Bridge, a wide wooden traverse set above minor rapids. Once across, bear slightly right as the trail switchbacks up the hill. Atop the embankment is a small parking area; the Falls Loop Trail continues left, weaving through a sliver of forest between the creek and a park road. Finally, at around 1 mile, the Visitor Center comes into view on the right and the circuit ends back at the Falls Overlook. 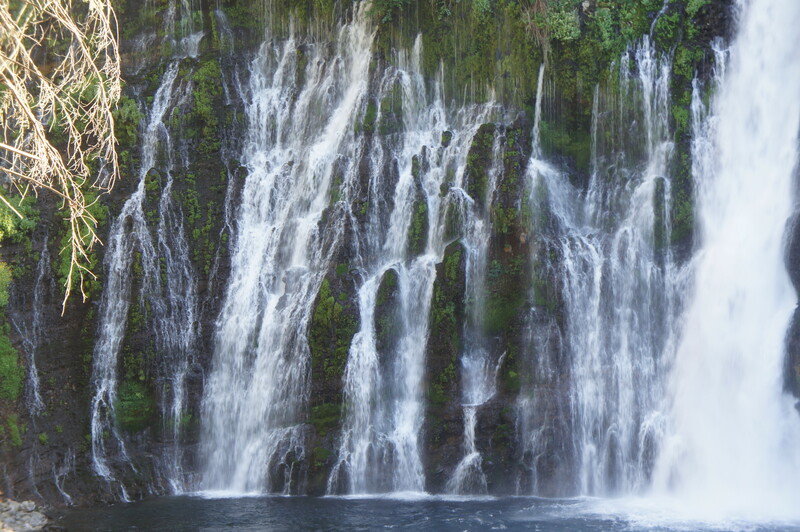 The Burney Falls Loop Trail is worth at least an hour’s effort—to leave ample time for admiring and photographing one of California’s finest waterfalls. 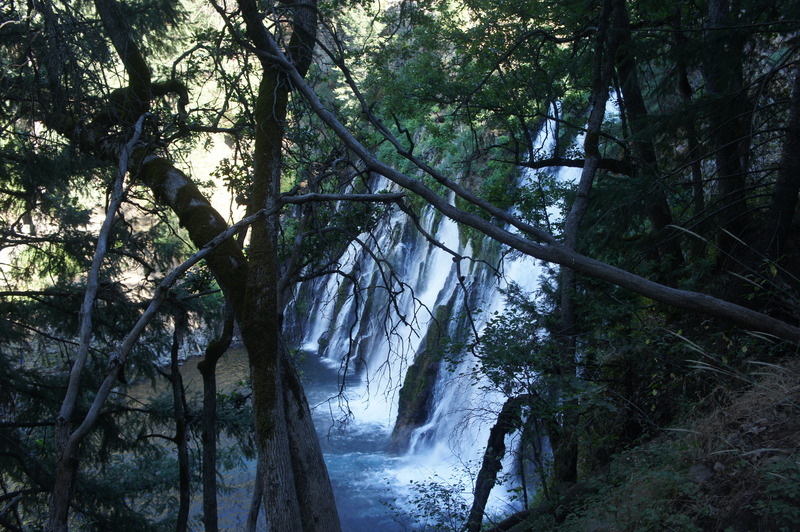 This entry was posted in California, Moderate Hikes, Mount Shasta area and tagged Burney Creek, Burney Falls, California, canyon, Falls Loop Trail, Fisherman's Bridge, loop hike, McArthur-Burney Falls Memorial State Park, Rainbow Bridge, waterfall. Bookmark the permalink.